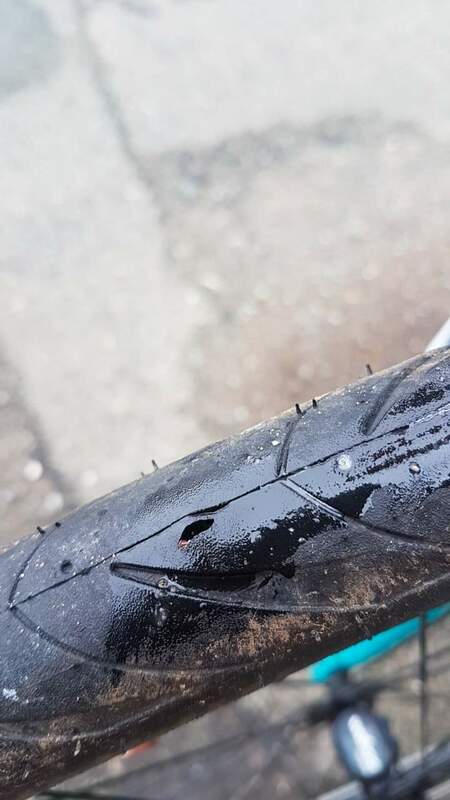 Last year I got a puncture in my tubeless tyre from a chunk of glass during a multi-day 500 mile ride (see photo below). The sealant did its job quickly and efficiently, and the seal has held without issue ever since (gotta love tubeless). In subsequent discussions a few people have suggested that I should repair the hole as soon as possible. As I've not been doing big rides of that distance I've marked it down as something to consider doing when I change my sealant. I'm going to be changing my sealant at some point in the next couple of weeks, so I'm trying to work out what the best way to perform a long-term repair is, to allow me to continue using my otherwise unblemished tyres significantly further into their life, if indeed I need to. So, my question is which of those (if any) is the "correct" way of doing it? The tyre in question is a 700x35c Schwalbe Marathon Supreme TLE. Honestly, judging solely from the photo; I'd probably keep riding it as-is until it lost air again, or you encounter another hit like that. Realistically, all liquid sealants should be refreshed/swapped out at least every 4-6 months and more frequently if you've lost some due to a puncture. If left to sit idle in a tire, all liquid sealants will eventually pool and solidify; more so in heat/summer climates. Monitor the area to see if it grows in size, then consider more invasive options. In the meantime, ride it until the next time you change out the sealant and open the tire up. The "Correct" way of doing it would be to replace the tire. All of the methods you mentioned are just patches and not foolproof methods of permanently fixing a tire. If the tubeless sealant successfully stopped the initial flat and you aren't slowly losing air, it should be fine and replacing the sealant should be a sufficient measure. Anything more and I'd look into replacing the tire. I have never seen a puncture small enough to be sealed with latex develop into something bigger. Not the answer you're looking for? Browse other questions tagged tire repair tubeless sealant or ask your own question. Can you run a standard tyre on a tubeless rim? Do road tubeless tyres lose air faster? How often should I refresh the sealant in tubeless tires? Tubeless tyres deflating - serious problem or just because I don't have sealant?